We don’t want our kids to burn out, overtrain, or get injured while they are enjoying life… As a result, we’ve created a program specifically designed for young athletes aged 10-18*. Our Young Athlete Program is a 3-month series developed to teach full body integration and functional movement. We truly believe that being athletic is a skill set that can be developed. Therefore, all skills and levels are welcome. No matter what your foundation is and if you’ve had prior training, we’ll help you create a sustainable workout & life. Moreover, our program is all about creating the foundational template of healthy integrated movement, strength, mobility, and work capacity so that our kids can put their skills on top of a strong, solid base – whether it be organized sports, or cross-training for life. 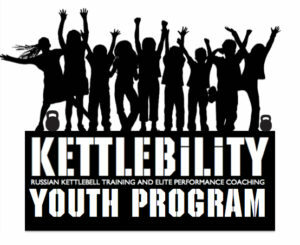 *If you have an exceptional young athlete below the age of 10, please reach out to us at info@kettlebility.com and we’ll see if it’ll be a good fit.